Freddie Fungus and Alice Algae have no likin’ for prions. Photo by 0olong. Genetically determined, except when it isn’t. The evolutionary context of misogyny. Queering evolution? The new frontier for evolutionary biology may be tracking adaptation to human-built environments. Mad lichen disease? 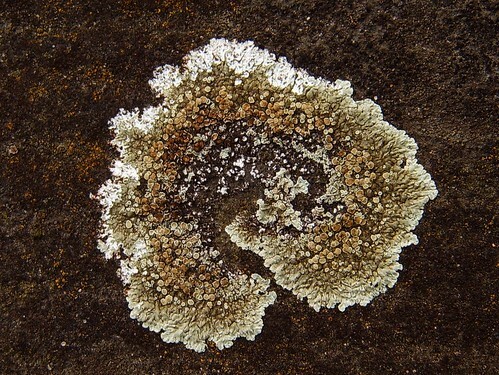 Some lichens can apparently break down prions. Really, where would it have gone? That big underwater plume of oil spilled into the Gulf of Mexico is still there. No surprise to field scientists, I suspect. Commercial GPS systems have some downright dangerous issues with their databases for rural and wilderness areas. “This was the original peer review: immediate and open” The increasing use of online platforms for post-publication peer review may be taking scientific discourse back to its Enlightenment-era roots. Guess I’d better get some more gel packs. Carbohydrate supplements during exercise do, in fact, help you work longer. I’m sure that if/ I took even one sniff/ It would bore me terrifically, too … Pair-bonding with a mate seems to make voles less prone to amphetamine addiction. Time to revise the bat “pollination syndrome.” A bat-pollinated tropical vine has leaves that collect and reflect its pollinators’ echolocation signals. This entry was posted in linkfest, science and tagged blogging, Research Blogging by jby. Bookmark the permalink.